Ever wonder what goes through a band’s mind while they’re playing on stage? Do they think about the crowd in front of them? Do past shows musically or psychologically impact future shows? Or is each show it’s own unique journey of new sounds, senses and experiences? For Brooklyn-based indie rock band The Fiery Furnaces it’s a little bit of everything. And as they return to Chicago this weekend we’ll take an inside look into one of the band member’s live show prep, concert memories and influences. 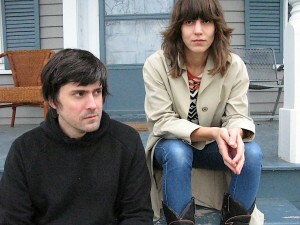 The Fiery Furnaces are Eleanor and Matthew Friedberger, a brother and sister duo who grew up in Oak Park, Illinois. Since 2003, they’ve released seven full length albums that embrace unpredictability in the songwriting and keep you guessing on every note and rhythmic detour. But with all the creative twists and turns sonically via piano, guitar or drums on their most complex or beautifully simplistic stripped-down tracks, the duo holds fast to their knack for telling a cunningly crafty story, lyrically and emotionally. It’s great to have the duo back in their hometown for the weekend as they return to Chicago to play two concerts in two different venues. And to get you ready for the back-to-back night affair, we’ll take a trip inside the mind of one half of The Fiery Furnaces, Matthew, as he shares with us which of his concert moments are the most memorable for him growing up in Chicago, and how those moments have influenced his approach to live performance. Going beyond inspirations, Matthew explains how high he would go to play at (or on top of) his dream venue; and then tells us the psychological role that fearlessness, duct tape and bored fans in the front row play during the band’s concerts. So give a listen to the two mp3 downloads (“Charmaine Champagne” and “Ex Guru” ) below, and be sure to check out the video for their track “Even in the Rain.” Not sure if it was intentional or just timely, but either way the video is a fine tribute to the late actor and Hollywood rebel Dennis Hopper and one of his classic films Easy Rider. More details on both concerts follows the interview. Live Fix: What shows or specific live music moments have influenced recordings such as last year’s I’m Going Away or your live album Remember ? M F: We think of our live shows as a different thing than our albums. Meaning that they should always be different. Making records is one thing; playing live is another. They are separate and autonomous spheres, so to speak. They should be slightly at odds! For instance, to speak simply, our album Rehearsing My Choir is not very ‘rock’. But live, the songs themselves decided to be played very aggressively. So to speak. ‘Live’ should have a mind of it’s own, don’t you think? In the same way that records shouldn’t be limited by how one habitually plays live. As an artist, what “Little Things” do you look for during a show for real-time insight or inspiration? I watch people watching the drummer, maybe. Really, I look for people who have come up very close to the stage, but who look bored and tired. I enjoy that. (I’m not joking.) I think that that is an…interesting dramatic situation. As a fan, what “Little Things” have you noticed during some of your favorite concerts? I remember the first show I went to, The Replacements at the Rivera in August of 1987. They all had duct tape on the bowling shoes they were wearing. Or was that when I saw them again in November of that same year? As siblings growing up in Chicago, what have been some of your favorite or most influential concert moments that you have shared together? Did one of you experience a concert first and introduce the other to live music? We shared no concerts together–none! Eleanor went to see things that I would not. Let me put it that way. What was your first live concert like as an rock musician and what did you learn from it? I remember being a teenager and thinking that playing a live rock show was no occasion for nervousness because you are most likely telling yourself what to play. And why would you tell yourself to play something you couldn’t? So, any mistakes you make must be, logically speaking, on purpose. You’ve decided to play them. Those things that are too hard for you to play, or however you think of them. So, one should always feel very comfortable. I do suppose, however, that you could be mad about something. If you could play one “dream” venue in the world where would it be and why? The top of the Sears Tower in Chicago, of course. With a big PA at the top of it so you could hear it all the way down at the corner on 95th and Western. If you could take one element of your favorite concert you experienced as a fan and use it to inspire your own live show, what concert and band would it be and why? I liked seeing the Jesus Lizard a lot. The music was very good, and the show was very fun, and very theatrical–without at all being so. The proper Rock-n-Roll way, I guess. What do you love the most about performing live? What elements of modern live performance would you could change if you could? Oh, that band’s don’t play. I don’t like seeing the Apple logo on stage with a Rock band, playing rock music. That seems less fun to me, if they are meant to be playing Rock Music, I guess. What is something unique about your live performance that fans might not realize or be aware of? Not sure, maybe they’d like to figure it out for themselves and let me know. You and Eleanor are in the midst of tour right now with stops at Empty Bottle and Fitzgeralds this weekend. Do you change your approach when you play in different venues, for different crowds in various cities? We do consider those things beforehand. And especially playing in Chicago, we think that we must do our best, we must do our utmost. And we also think that you don’t necessarily want to blend into the venue too much. Playing live is very particular, act to act, music to music. But we know that fans always want to hear something different when they come to a show. Thanks again to Matthew for taking the time to talk about his and the band’s concert experiences. The Fiery Furnaces – Even in the Rain from Thrill Jockey Records on Vimeo. What’s On Dad’s “Set List” This Year?